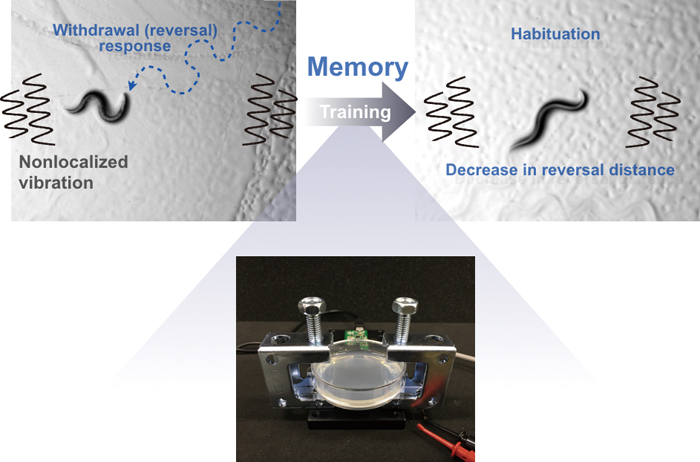 Withdrawal escape response of C. elegans to nonlocalized vibration is a useful behavioral paradigm to examine mechanisms underlying mechanosensory behavior and its memory-dependent change. However, there are very few methods for investigating the degree of vibration frequency, amplitude and duration needed to induce behavior and memory. Here, we establish a new system to quantify C. elegans mechanosensory behavior and memory using a piezoelectric sheet speaker. In the system, we can flexibly change the vibration properties at a nanoscale displacement level and quantify behavioral responses under each vibration property. This system is an economic setup and easily replicated in other laboratories. By using the system, we clearly detected withdrawal escape responses and confirmed habituation memory. This system will facilitate the understanding of physiological aspects of C. elegans mechanosensory behavior in the future.